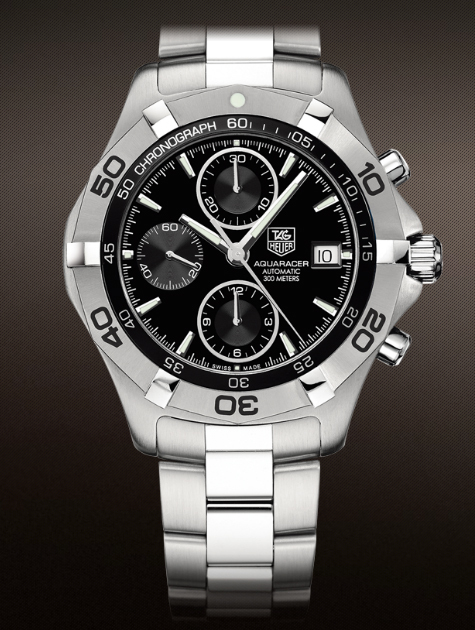 The Tag Heuer 2000 Aquaracer Calibre 16 Automatic Chronograph 41 mm Men’s Watch CAF2110.BA0809 was designed with water sports and diving safety in mind, therefore it is rugged and well wearing. However it will also serve handsomely, as a precision timepiece for everyday casual or business wear. 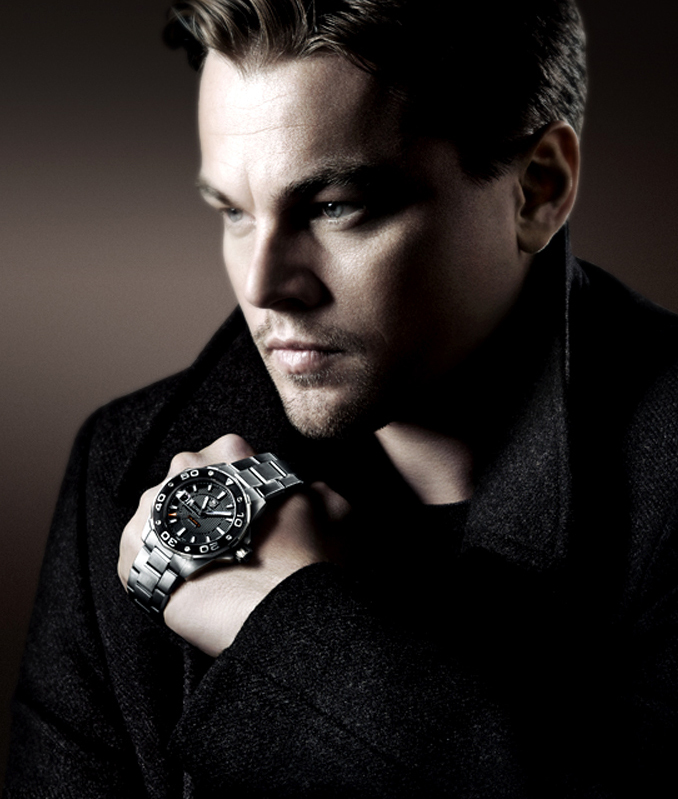 Leonardo DiCaprio is a fan of this watch, as indeed many celebrities are, and can often be seen endorsing it. What makes it so popular? First, the Tag Heuer Aquaracer collection was “designed and developed by professional divers.” It is suitable for water sports, or any sports, for that matter, especially those in which the wearer might want to measure time, in increments up to 12 hours, or in minutes, or down to 1/10 of a second, with pinpoint accuracy. This watch has three chronograph sub dials, which allow you to do just that, while the main dial allows you to keep standard time, at a glance. This watch provides choices that should serve all of your timekeeping needs. It is tough. Double gaskets for the screw-in crown helps to ensure its water resistance to 3oo meters, or 1000 ft. In concert with this, its fine, brushed stainless steel wristband, bezel, and case provide stability and durability against everyday knocks. Sapphire crystal protects the watch face, and is so hard that only a diamond can scratch it. This is not a watch that requires babying. It is built for action. It is practical. Besides the superior durability and water resistance of this timepiece, it also keeps precision time with a highly legible display, via the luminescent dial, hour, minute and seconds hands. This makes the aquaracer a great choice for use in the low light of a restaurant, or at the bottom of a swimming pool. There is also a date window at the 3 o’clock position, and a very secure clasp on the wristband with easy to push buttons, so you needn’t fear losing it. Round black dial with luminescent white markers and hands. Case back engraved with diver’s helmet. 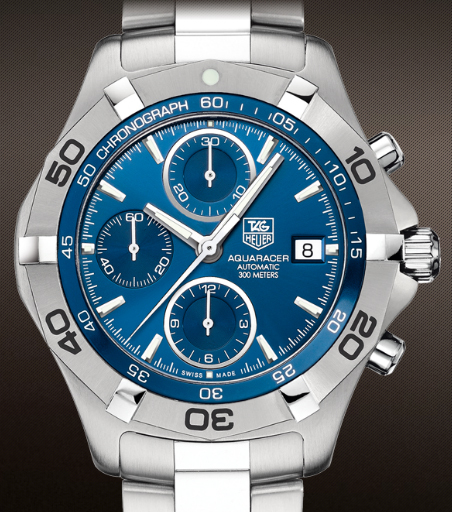 Three chronograph counters measure hours, minutes, seconds, or sub-seconds. Water resistant to 300 m / 1000 ft. This model of the Aquaracer is also available with a blue dial, which I think is quite attractive, but it may not serve as well when it comes to visibility, since there is less contrast with the white markings and hands on the dial. For other variations within the Aquaracer Collection, see TagHeuer.com. Many consumers really love this watch, but there are those who really would prefer something simpler. If you do not need the sub dials with extra time measurement choices, this may not be the watch for you. This watch’s features also ensure that it carries some weight; coming in at 16 ounces, some find it rather burdensome on their wrists, especially initially. However, many people say that they get used to it after a relatively short period of time. This watch retails at $2,700, but I have seen several deals online as well. Because of the luxury and precision features of this watch, especially its water resistance details, it should only be purchased from an official Tag Heuer dealer, and returned to the same for maintenance concerns, questions, or any other issues.